The working uniform worn by enlisted crewmen. The UNSC Navy Working Uniform is the standard uniform worn by officers and ratings of the UNSC Navy for shipboard physical work and combat, as opposed to the dress and service uniforms. In this respect, they are much like the fatigues worn by UNSC Army and Marine Corps personnel. The combat-ready uniform is worn by both commanding officers and junior crewmembers when battle is expected. It consists of a double-breasted olive drab tunic, bearing the seal of the UNSC Defense Force (though this may only be the case when assigned to work alongside Defense Force elements such as the Army and Air Force for extended periods of time), with the wearer's surname printed above the seal. It is worn with matching trousers with cargo pockets, a belt-worn pistol holster, and a baseball-style cap, also bearing the UNSCDF seal. The combat-ready uniforms of ship commanders bear the ship emblem on the right shoulder. Medals and ribbons are not worn with this uniform. A more austere version of the combat-ready uniform features the wearer's name on the left breast. Rank insignia are not displayed on the shoulders, and UNSCDF affiliation is also not displayed. A cap is not worn with this version. This is likely a training uniform, as its only known use was by drill instructors on Reach during SPARTAN-II training. Simple service coveralls are the basic uniform worn by UNSC Navy personnel while on duty. Enlisted rank insignia is worn on the upper sleeve. Most working uniforms are comprised of a light gray shirt, matching trousers, and a belt; these uniforms also have darker sections that display the UNSC insignia and overall resemble the combat-ready uniform. The letters "UNSC" are displayed on the backpiece. Others are comprised of a single jumpsuit and are colored based on the wearer's technical specialty: Red, green, and blue are the most commonly used colors. [note 1] With both versions, the wearer's name is displayed on the left breast. Crew of the UNSC Spirit of Fire employ high-visibility yellow jackets, hard hats and visors for working in maintenance and engineering. The color-coded working uniforms seen in Halo: Combat Evolved and Halo 3 are almost identical to those worn by BOBs in the Marathon trilogy. However, in Halo: Combat Evolved Anniversary, all Navy personnel aboard the UNSC Pillar of Autumn wear gray two-piece uniforms which resemble those seen in Halo Wars, Halo: Reach, Halo Legends, and other more recent media. Halo: Combat Evolved concept art. The Naval uniforms seen aboard the UNSC Pillar of Autumn in Halo: Combat Evolved. 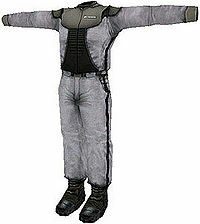 Working uniforms issued to non-combat personnel in Halo 3. Captain James Cutter in combat-ready uniform in Halo Wars. Two cryo technicians in two-piece working uniform in Halo: Combat Evolved Anniversary. A crewman aboard the Pillar of Autumn wearing a working uniform. Concept art of an technician on the UNSC Infinity. Concept art of an engineer on the Spirit of Fire. Cutter's hat in Halo Wars 2. A render of an engineer on the Spirit of Fire, male variant. A render of an engineer on the Spirit of Fire, female variant. ↑ This section does not list all the colors seen in Halo: Combat Evolved, as all the working uniforms in Halo: Combat Evolved Anniversary are gray and those seen in Halo 3 are red, blue, or green.